Great manga version of the most famous of Poe’s tales. 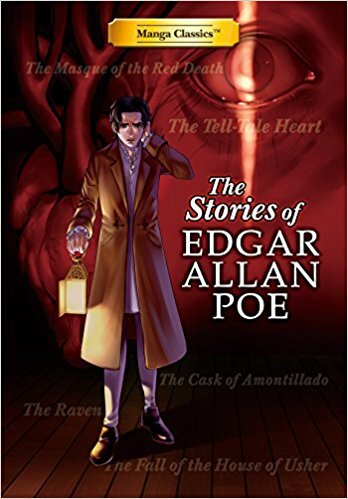 This volume of Edgar Allen Poe tales includes The Raven, The Tell Tale Heart, The Cask of Amontillado, The Fall of the House of Usher and The Mask of the Red Death. All are famous as Poe’s best work. The adaptation of The Raven holds up the best as it is included in its entirety. Even though I have previously read this work many times and saw it as an adaptation on The Simpsons, I believe this is the best version that I have ever encountered. The Mask of the Red Death explains the plot much better than the original story or the silent movie with Lon Chaney. All of the stories still have a feeling of increasing dread as you read them. If you have a young adult that can’t get through the old fashioned language used in the original stories, this would be the perfect gift. The pictures explain words that I just skimmed over when I originally read the stories in high school and college. In addition, the adapter’s notes for each story explain items even further. For example, I had no idea about the story behind the beetles in The Tell Tale Heart. The artwork acts like manga (read back to front and right to left) and the characters look like manga characters while staying true to clothing styles from the 1840s when these stories were written. The artwork sets the mood for the psychological horror ambiance of the tales. 4 stars! Thanks to the publisher, Udon Entertainment, and NetGalley for an advanced review copy. The Stories of Edgar Allen Poe: Manga Classics was published on October 17, 2017.